For the last three years, I have looked forward to the weekend of the Pyramyd Air Cup with great excitement, but also some apprehension. It’s a massive undertaking that detracts from the day to day here in the office. Thankfully, we’ve learned many lessons from the past two years that aided us in making this year’s Cup better for everyone. Before I get to the match report, I want to say a few “Thank You’s” to some of the important people. First and foremost, a MASSIVE THANK YOU, to Pyramyd Air Marketing Manager, Kristen Coss. Without Kristen, this event simply does not happen. 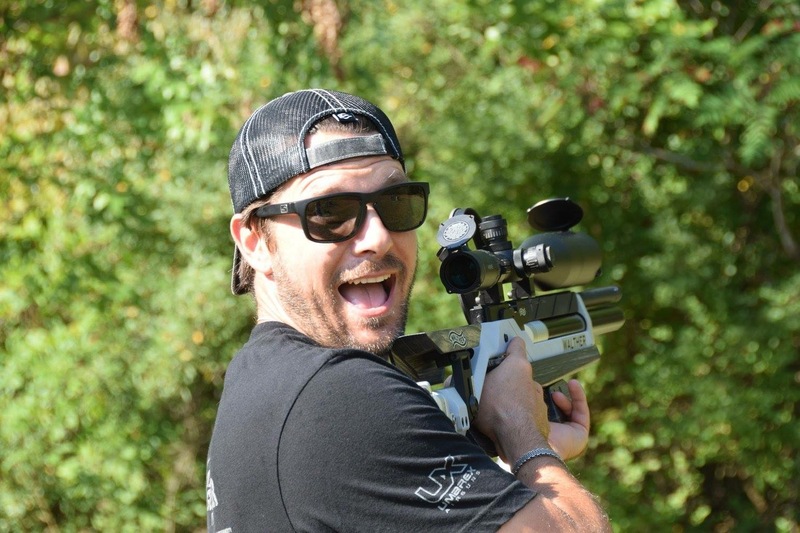 It’s my job to make sure everyone has targets to shoot at, and has a good shooting experience. Kristen handles literally everything else. From the fantastic banquet on Saturday night, to prepping materials needed and even coordinating with the schedules of some of the great vendors who attended. She does it all, and while I am the one who gets much of the praise at the conclusion of the Cup, she deserves far more than I. 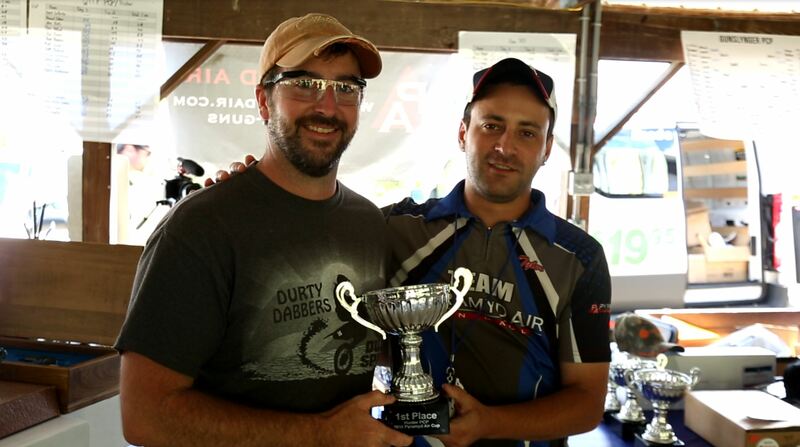 Second, I need to thank my clubmates from the Ohio Airgun and Field Target Shooters Association. Bill Rabbitt, Jeff Paddock, Roger Barker, and Mark Oehlburg to be specific. 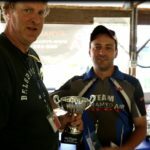 Bill and Jeff built all of the tree stands used for the match, Roger provided me the agenda he uses at our club matches for the shooters meetings which helps keep me on track. And all four of them help maintain our targets. And most importantly, they keep me sane during the chaos that is the Cup. Thank you guys for ALL of your help, your friendship and your commitment to our sport. And I apologize for ruining all of your gorgeous paint jobs on the targets…looks like we will have to spend another evening of painting them up again. For those that do not know, the Cup really starts on Thursday for us. 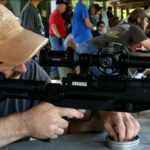 We go down to Tusco Rifle Club in Midvale, Ohio and spend the entire day setting up. 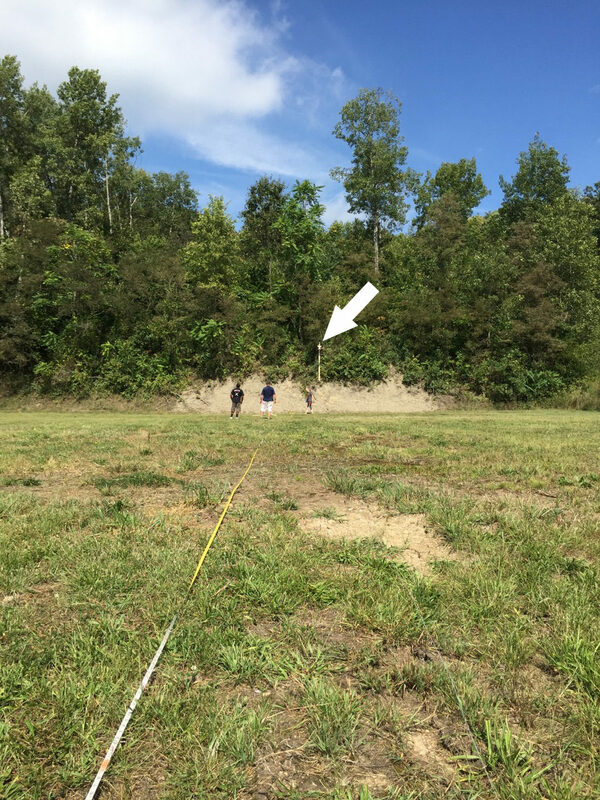 This year, we had five Pyramyd Air employees down there and with the expansion into the wooded areas behind ranges 7 and 8, each of them was needed. The expansion was largely an effort to get out of the wind and also, with upwards of 90 competitors signed up, we needed to space things out better than in years past. We began setting up the FT courses, and despite the high chance of rain Saturday afternoon, we made the tough call to put the courses totally out in the open. Unlike last year, there would be no Field Target shot from under cover. 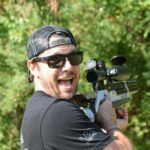 FT set up went well, and we were able to work in some interesting target placements in the trees and one on the berm on range 8 that I am particularly proud of. 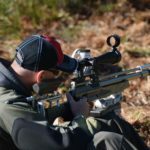 It was a 55 yard target that was placed in an 8 foot tree stand that we managed to work up the birm at the back of the range. 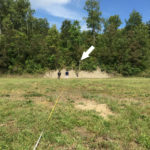 While the angle did not add any difficulty, it put the target high enough to get into a different wind stream than the targets placed on the ground. If you haven’t heard, Tusco’s ranges house some extremely tricky wind. So much so, that in designing the courses I had trouble laying out a 28T minimum course because I didn’t want it to be too hard. Anyway, the five of us managed to get everything set up by 5:30PM, which is a record at this point. Last year we were there until after dark setting up, and still had things left over to do. This year though, things went much smoother….but the ease and timing of it all left me feeling like we had forgotten something. Thankfully we hadn’t. 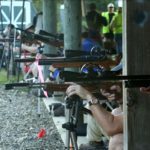 We arrived back at the range Friday morning and were greeted by many of the competitors who arrived for the 9AM sight in range opening. I noticed on Thursday how bad the winds seemed, and Friday morning, many of the gunslynger targets had been blown over by the wind. If this was a sign of the wind for the remainder of the weekend, I should’ve pre-emptively began apologizing to competitors in advance! Shooters began signing in, getting their swag bags and shooting. Before long the sight in line was full of new and familiar faces. I spent a great deal of time just chatting with old friends and making new ones. Tom Gaylord made the trip this year and I spent a good deal of time talking to Tom about many things. I really enjoy seeing Tom, he’s one of the legends in my eyes and deserves tons of praise for all he has done for the sport. 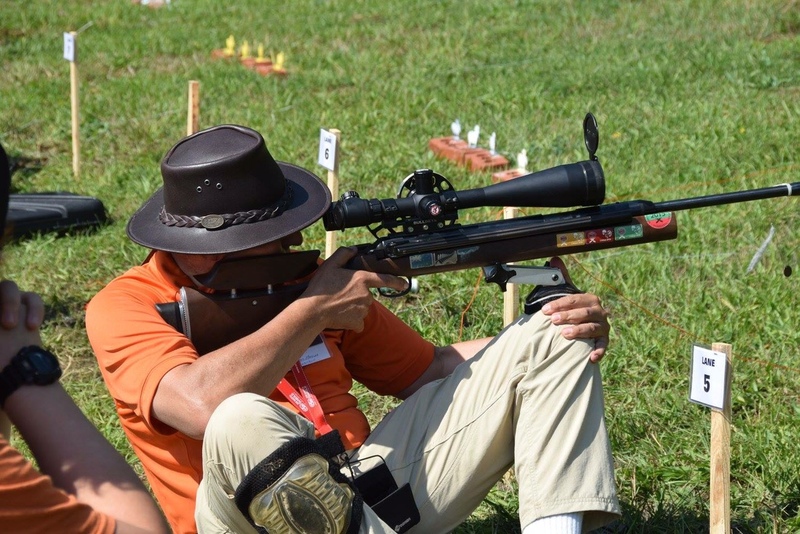 Some other shooters attending their first Cup (but certainly not their first shoot) were familiar faces from the south, David and Dottie Slade (TN), reigning national champion Ken Hughes, Rob Seiden, Ron Brown and Andy Burns (GA). All great folks and I am glad they made the trip. It means the world to me that we draw shooters from across the country and not just the region. Our furthest shooter came from California in the form of Jim Cyran. Jim is a great guy, and I found out earlier this year that he actually has family near Cleveland and grew up here in Northern Ohio. So the Cup was the perfect excuse for Jim to come into town and see his family. Thanks for making the journey Jim! Friday is when we hold our Payday Challenge. 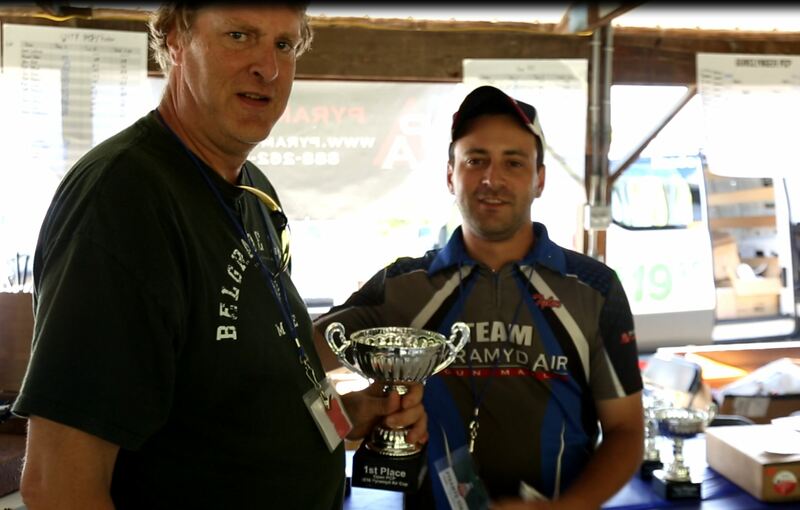 We bring along three different rifles, this year we had the Beeman HW100T, Air Arms TDR, and the Airforce Condor. 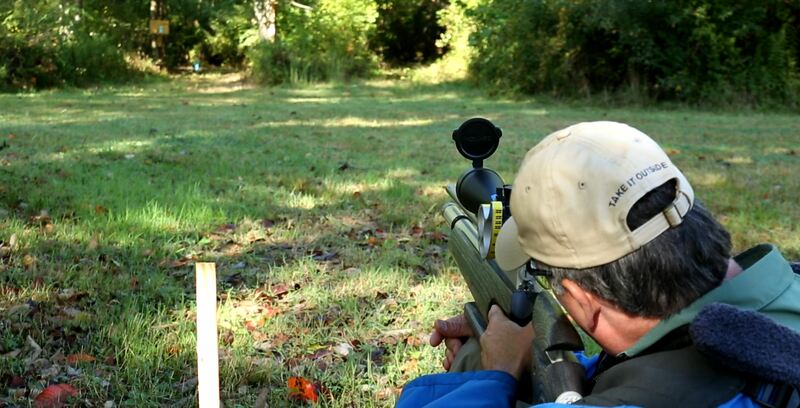 The targets were 1.5” kill zones on field targets at 40 yards, 25 yards and 15 yards. The Condor was shot twice, offhand at 15 yards. 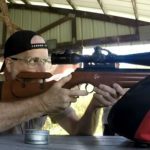 The TDR was shot at 25 yards, three times, and also offhand. 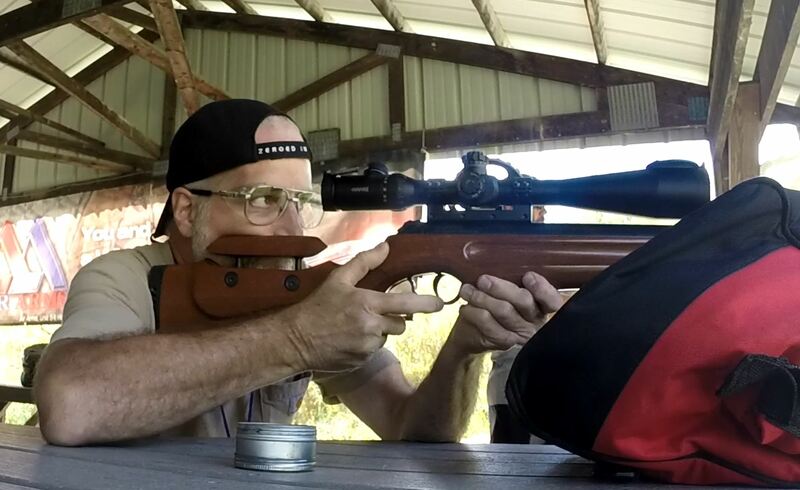 While the HW100 was shot at 40 yards and from the bench, and the competitors took five shots. 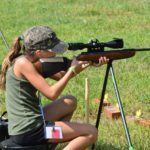 This is a fun little side competition that lets competitors try new guns that they may not have a chance to try otherwise. We cycled through 53 shooters and came to a three way tie. Hitting 9 out of 10 shots each were Ken Hughes from GA, Dave Hitchcock from OH, and John Eroh from MA. 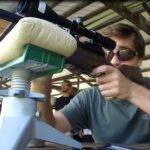 The shoot off for the $200 prize was with the HW100 on the 40 yard target…but instead of at the bench, competitors would shoot it standing. After MANY rounds and no contact with the kill zone, they switched to kneeling. After multiple kneeling tries, Ken Hughes (going first of the three) missed and I was ready to ask if they just wanted to split the prize, but then a glimmer of hope as Dave knocked the Rat on the Run Target over to a roar of cheers! I breathed a quick sigh of relief as John took the rifle and knelt. I knew at that moment he would hit the target. He did and extended the shoot off to an even bigger roar from the onlookers. At that point, we asked if John and Dave wanted to keep shooting or if they wanted to split the prize money. They chose to split it so we crowned two Payday Champions, congrats gents! To wrap the day up we filmed a few segments for American Airgunner’s Round Table featuring Ken Hughes, Tom Gaylord, Rossi and I. We had a good time and there should be a lot of good footage that I’m sure you’ll be seeing down the road. Ever excited, Rossi must not realize he’s shooting the standing lane! Saturday morning rolled around and it was time for the real competition to begin. Targets were lubed, strings were pulled and the stage was set. The shooter’s meeting went painlessly and the shooters made their way to the lanes. The sun was shining and it appeared the threat of rain was going to hold off, at least until we finished the FT match. 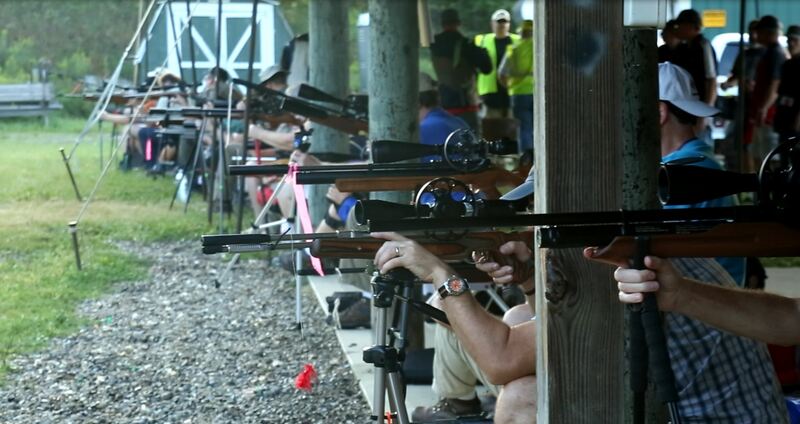 Most of the WFTF shooters were on range 8 in the open field. This was particularly tough because the wind was dialed up just for them! I spent most of the FT match running around like a madman just making sure everything was running smoothly and that everyone was enjoying the course. The courses turned out to be 28.04T and 29.19T respectively on the Troyer scale. This is not factoring wind of course. With wind factored, the course difficulties bump up to 31.9T and 30.6T. Regardless of what course you shot, or the day you shot it, they were laid out to shoot similarly. Our 12 lane course in the woods area featured 9 targets over 40 yards, that’s 37.5% of the targets. And only one of those targets was between 40 and 45 yards. On the 13 lane course on range 8, the course featured 10 targets over 40 yards, 38.5%. This is a trend I would like to see elsewhere, and one that we see at Worlds frequently, longer courses. Having more targets at distance does a few things I feel are more challenging than small kill zones. 1) Your wind doping has to be on point! 2) Ranging the target becomes far more important, for all classes. At Tusco, I know there is going to be tricky wind, so when laying out the courses I can pretty much count on that to be there. 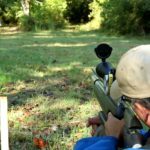 Now, there are certainly moments when it slows down, but it’s something that a good shooter must constantly be aware of. The way the wind swirls and changes direction is what bites most shooters. They get into a groove, get used to the wind doing one thing, take their next shot and BAM! Faceplate. Guess what? Wind changed on you and you didn’t even see it. This is one of the great challenges of field target that we all face, how on earth do you dope for wind you cannot see? Back to Saturday’s action. I was keeping a close eye on a few shooters in particular that I felt would do well. Ken Hughes and Greg Sauve on the open course and Rob Seiden, Bill Rabbitt and the Himes brothers (Dennis and Tom) on the wooded course. Sure enough, Greg came in on a very impressive 46, dropping just six shots in the tricky winds. His effort was equaled by Jerry LaRocca, with Matt Sawyer coming up just one shot behind (45) and Ken Hughes and Tom Holland two shots back on 44. On the woods course, Bill Rabbitt delivered the high Hunter PCP score with a 42, with Dennis Himes and Glenn Thomas two shots back on 40. In Open PCP, Rob Seiden delivered a 42 as well to come away with the lead for the day. In Hunter Piston, Peg Brewer produced a top score of 36, not only did she top husband Eric, but she came in ahead of the entire field! Way to go Peg! Michael Finchum and Paul Manktelow were just one and two shots back respectively, so it would all be up for grabs on Sunday. 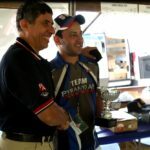 In WFTF Piston, Hector Medina Gomez returned from Worlds with a fire in his eyes and lit up the field with a 40! Nathan Thomas was a whopping five shots behind on 35. 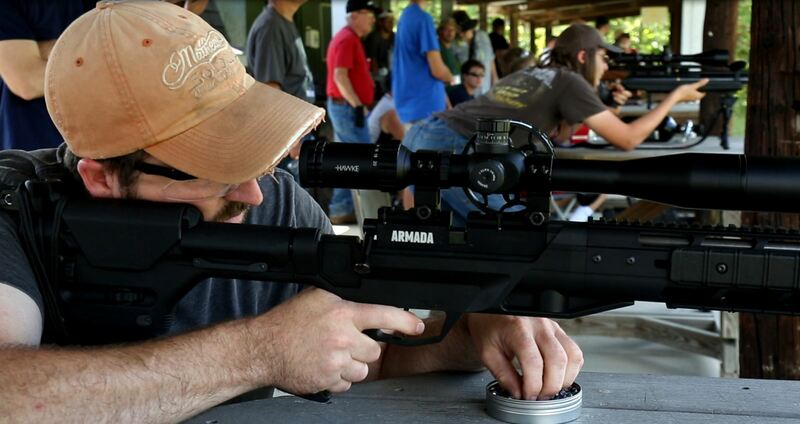 With Saturday’s FT action done, shooters gathered for lunch and then we met for the Gunslynger. 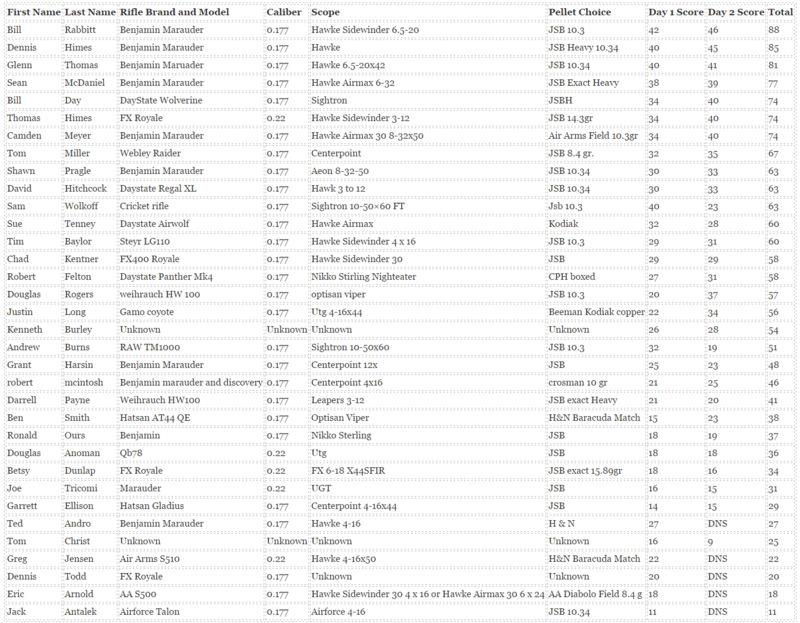 We ended up having 31 competitors on the PCP side and 15 on the Piston side. The wind was ripping through both ranges pretty good but with the increased power levels that are allowed in the Gunslynger, many competitors were relatively unaffected. 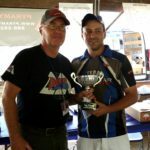 On the PCP side, Bill Rabbitt continued his dominance in the Gunslynger, moving through the first few rounds with ease. So much so, that in his second round match against fellow OAFTSA club member Tim Baylor, Bill took out all 16 silhouettes before Tim got his first shot off! That’s one of the drawbacks of using a magazine in this competition. It is usually far faster to single load. On the opposite side of the draw, Greg Sauve looked to be unstoppable. 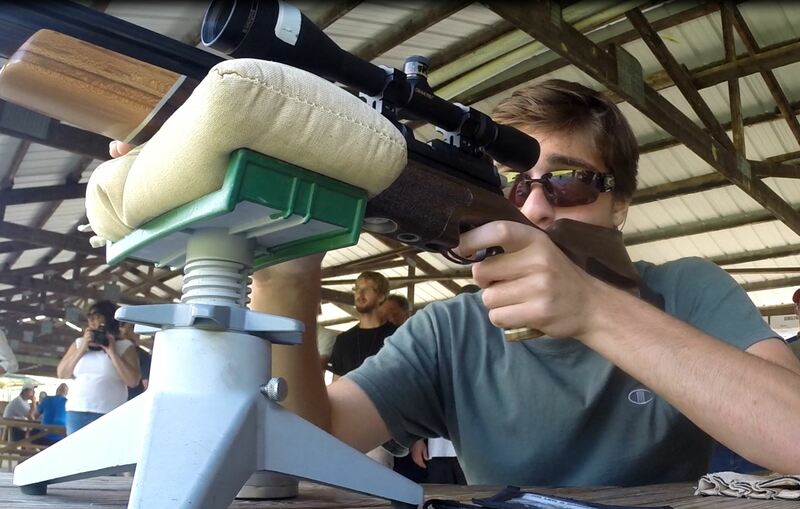 His loading and shooting was butter smooth, barely even taking his eye out of the scope through his first rounds. Both Rabbitt and Sauve breezed their way into Sunday’s final match with $1000 on the line. In the 3rd place match, Brian Van Liew and Nic Gregoris would square off for the $250 prize. On the springer side, two time defending champ Ray Apelles ran into early trouble. Winning his first round narrowly after spinning a target and having to shoot at the edge of the silhouette to take it down. In his next round, he was not so lucky. David Kokai took down the defending champ to everyone’s surprise. Rob Seiden cruised into the semi-final match up with Kokai. His Beeman R11 was shooting well for him and he dispatched Kokai to get himself a shot at the $1000 grand prize. The other semi-final saw two competitors that have developed something of a rivalry over the last few years in this event and on the FT course. Keith Walters and Eric Brewer squared off with Brewer coming out victorious. The final match between Brewer and Seiden would wait until Sunday as would the 3rd place match between Kokai and Walters. After the match ended, I took some time repainting the targets and reflecting on the day. That evening, we got to enjoy a fantastic meal at the nearby Elk’s Lodge. The food and drinks were top notch, as was the conversation. But the fun really started when Rossi Morreale hosted the yearly raffle. We had scopes and rings from Leapers, a John Wayne Duke Revolver pistol, a Hawke Airmax 30 scope and an entire case of JSB Express pellets! The banquet is something that a lot of matches don’t have that I think they really should. It’s not just about sharing a meal with your fellow competitors, but it’s a great time to reflect on the day with everyone and make some new friends who you may not have gotten a chance to talk to at the match. After a few drinks, I headed back to the hotel to do the squads for Sunday’s FT match. I think I had one too many because between that and how tired I was, I totally forgot to squad one lane, and it threw all of my numbers off! Needless to say, that was a quick fix in the morning but one I really shouldn’t have made. So if you weren’t happy with your Sunday squads….blame the bartender at the Elk’s Lodge! Sunday morning came with a slight chill on the air. 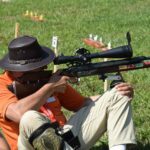 Compared to the heat and sun of Saturday, the rains during the banquet brought in a cold front that must have been near 50*F. Some shooters noticed some changes in their rigs as a result of this temp shift. We had the top shooters together and the stage was certainly set for some good finishes. While the wind was certainly there, it was not as harsh or unpredictable as Saturday. We saw some seriously high scores, and the top shooters were all on form. In Open PCP, Brian Van Liew made the biggest jump up the leaderboard, posting an impressive 48 and totaling out at 84/100 for the match. 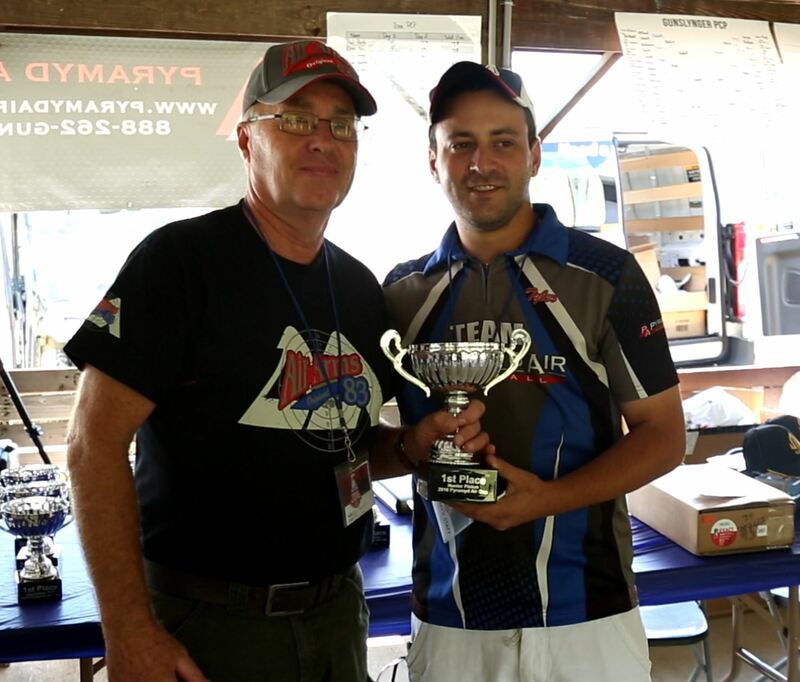 Rob Seiden stayed consistent with another 42 to equal Brian’s total of 84. And Mike Harris posted a 42 as well to secure 3rd place. This meant we had at least one shoot off at the end of the day! 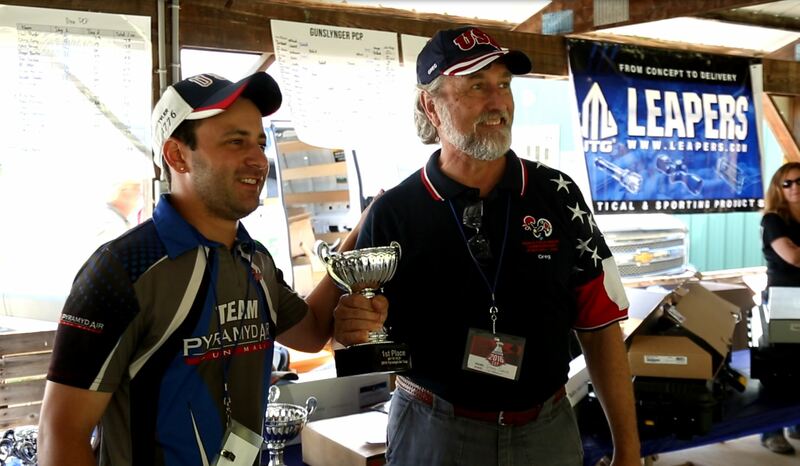 In Hunter PCP, Bill Rabbitt kept his cool and turned in a class high 46 for a total of 88 on the weekend. Dennis Himes and Glenn Thomas were just a few shots behind with 85 and 81 respectively. In Hunter Piston, we saw significantly lower scores on day two, with the high score coming from Paul Manktelow and Jim Cyran both shooting 31. This catapulted both shooters ahead of day one leader Peg Brewer and the rest of the field. Paul totaled out with 65, while Jim came in with a 63. And two points back was Peg, on 61. WFTF PCP was decided in usual fashion for Greg Sauve, he dropped just three shots to come in with the match high score of 91/100. Jeff Paddock, Ken Hughes and Tom Holland delivered 44’s, this meant we had another shoot off for 2nd/3rd between Ken and Tom as they tied with 88 each. And in WFTF Piston, Hector held on to secure the title with a class high 36. Nathan Thomas wrapped up second place with a 35 and Ray Apelles finished on 67 to take third. It was time for shoot off’s and the first up was Ken Hughes and Tom Holland. There were two targets placed for each shooter. One at about 38 yards and another at 53 yards, both 1.5” kill zones. Each shooter had to hit the first target to move to the second. In the event they hit both, we would move to kneeling, and then standing if necessary. There was definitely some wind out there, but both shooters dropped the near target. On the far target though, Tom quickly took it down…Ken waiting for the wind a bit longer and took the shot, but the target stood tall. Ken split the pellet on the left edge of the kill zone. So Tom took home second place. Congrats Tom! In the Open PCP shoot off, Rob and Brian took on the same targets. Both shooters nailed them from the seated position easily. When it came time for kneeling, Brian took down the near target quickly and Rob was unable to match. So first place went to Brian! Excellent shoot off and congrats. And then for the grand finale, the Gunslynger 3rd Place matches and Finals. First, we saw Keith Walters and David Kokai square off for 3rd place in the springer draw. Keith took a couple target lead and kept it going all the way through the finish. Taking home 3rd place for the second year in a row. Next up was the 3rd place PCP match between 17 year old Nic Gregoris and Brian Van Liew. It was a good match that saw the youngster come out victorious. Excellent shooting to Nic and Brian. 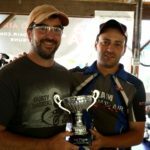 This was Brian’s first Cup and to find himself at the top of his FT class and with a shot at a prize for Gunslynger as well must have been thrilling! It was time to decide the winners of the $1000 grand prizes! Eric Brewer and Rob Seiden settled into their benches and the match began. Rob started at the back with the rams, and after a few initial stumbles, he found his mark and began rolling through targets. But on the other bench, Eric was already well into his targets. Eric seemed poised to win the match, especially after spinning a turkey, and hitting it cleanly on the very next shot. He finished strong and took home the $1000 grand prize! Well done Eric! On the PCP side, it was maybe the quickest match we have ever seen. Bill Rabbitt and Greg Sauve squared up and after only one minute, Sauve was crowned the champion. Bill started strong, and even had the lead on Greg at one point, but stumbled on the turkeys which gave Greg an opening. Once he made it through the turkeys, Greg turned on the jets and left Bill in the dust. It was a thrilling matchup and both shooters did quite well. I know it left everyone in a bit of amazement at the speed and accuracy each was able to attain. Congrats Greg, it was a clean sweep this year! Natalie Putz shooting her HW30s. Thanks to Peg Brewer, she now has a new scope! We handed out the various prizes and awards. 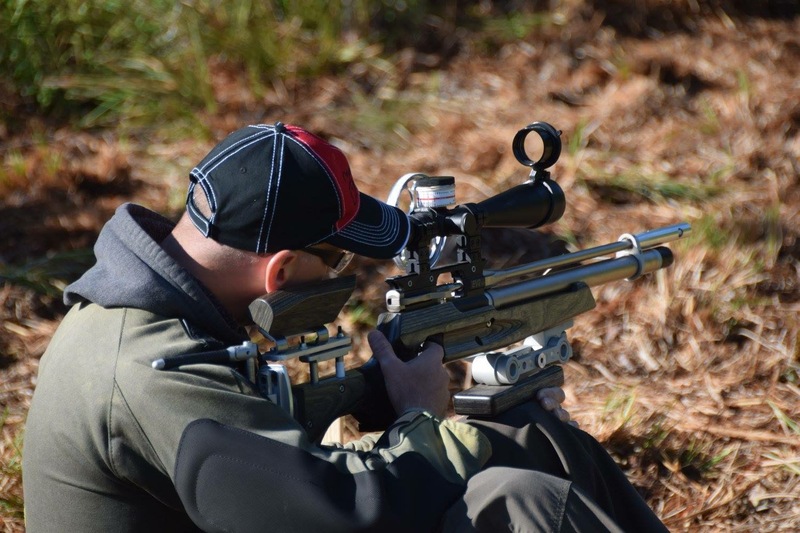 Greg took home an FWB 800 Evolution 10m rifle on top of his Gunslynger winnings. There were guns donated from Diana, Walther, Air Arms, Airforce and Beeman. Scopes from Leapers and Hawke, cases from Plano and even a full case of pellets from Predator International. But I want to take a second to mention what the Cup is all about. 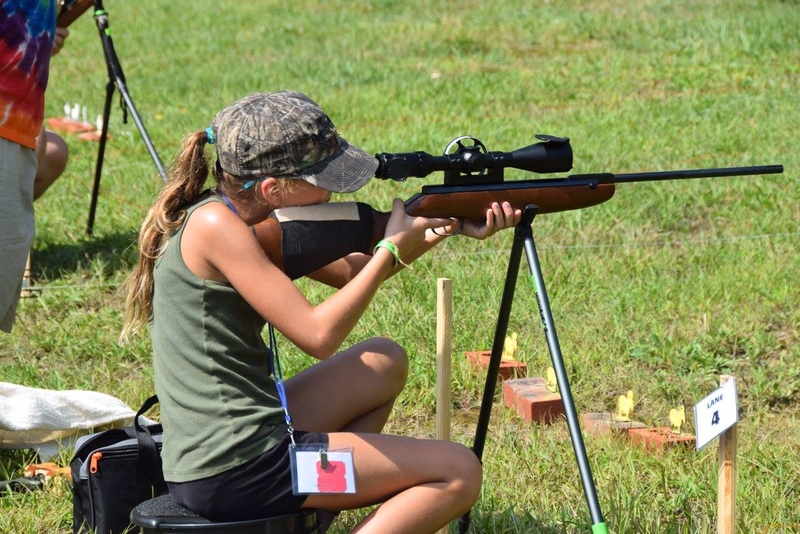 There is a junior shooter, from our club (OAFTSA) named Natalie Putz. Natalie and her father Dan have been shooting with us since last year. I want to say that Natalie is around 11 or 12 years old. 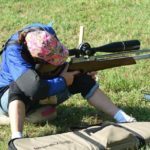 She shoots an HW30 break barrel and at our club matches, usually does quite well. 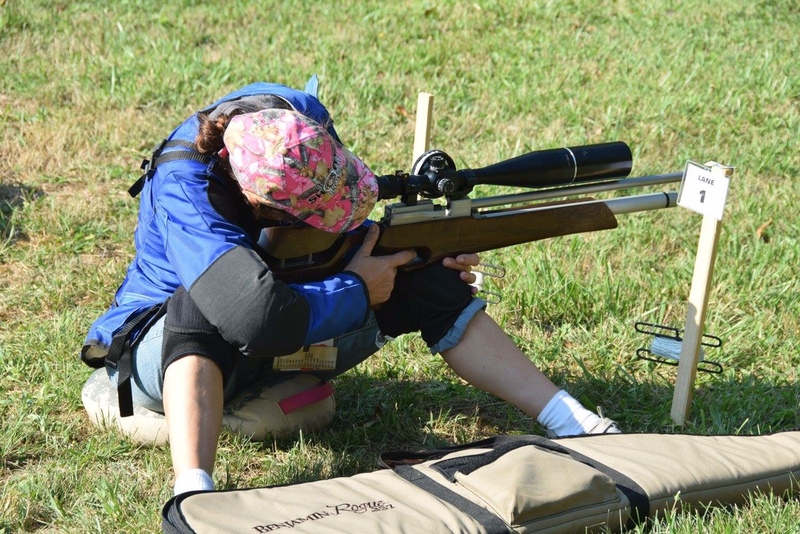 Her rig does not have enough power to take down many targets past 45 yards, but at the Cup, she must have been hitting them just right because she took a couple down that left many folks impressed. That brings me to my point, Peg Brewer took third place in Hunter Piston and when it was her turn to choose a prize, she had a Leapers 6-24x scope or a Walther break barrel to decide between. She chose the scope, walked right over to Natalie and handed it to her. She said “Us girls need to stick together”, as she gave her prize up. That was touching to see, and that is what Field Target, and in turn Airgunning, is all about! Thank you Peg, and thank you Natalie…you’re both the reason why many of us shoot. It’s about the people, the camaraderie, and the atmosphere that keep many of us coming back. And I am beyond happy to say that the Cup has that in spades. We had 16 prizes, and 15 prize winners, I was not sure what to do with that last prize, but when Peg gave hers up, I felt it was only right that her act of selflessness was returned. We made sure Peg walked away with a prize and she got the Walther and a nice Plano case as well…nothing went to waste on our watch! I cannot describe how tired I am after this years Cup. Last year I shot the match and don’t remember being this tired. I don’t really care, it was all well worth it at the end of the day. To everyone that attended, THANK YOU! I said it at the close of the awards and I will say it again, it is each and every one of you that has made this event what it is today. It’s not those of us that run it that make it special, it’s those who attend it and inject their personality into it. 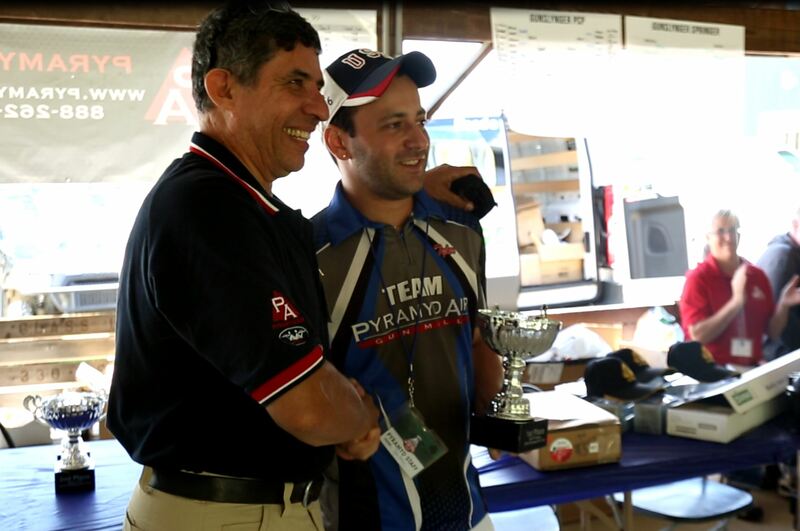 Without you all, The Cup, Pyramyd Air, Field Target, and the Airgun Industry would not be what it is or where it is. The success and continued growth of the Cup is a blessing and there is nothing I want to see more than it continue to flourish and grow for years to come. Wondering how we are going to do that??? In due time my friends…in due time. To my fellow Pyramyd Air employees that assisted and dedicated their precious time off to help us run the Cup, I owe you a debt of gratitude. 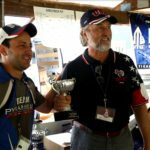 I look forward to seeing many of you in a few weeks at Nationals in Michigan, and if not there, hopefully next year at the 2017 Pyramyd Air Cup. But until then, shoot safe and see you on the lanes.